Publish Paper Now. Quick Publishing & Review. 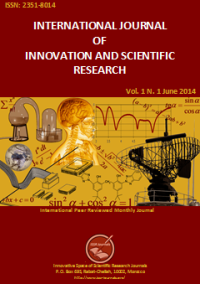 International Journal of Innovation and Scientific Research (IJISR) is an open access, specialized, peer-reviewed, and interdisciplinary journal that focuses on research, development and application within the fields of innovation, engineering, science and technology. Published four times per year, it tries to give its contribution for enhancement of research studies. Contributions must be original, not previously or simultaneously published elsewhere. Accepted papers are available freely with online full-text content upon receiving the final versions, and will be indexed at major academic databases. Papers can be written in English, French, Spanish or Arabic. The acceptance rate of the journal is 75%. All articles are sent for blind peer review, with a very fast and without delay review procedure (within approximately two weeks of submission). Submitted papers should strictly follow the format of the sample article. Publication fee for each accepted article is $80 USD. Aeronautical/Aerospace Engineering, Agronomy, Anthropology, Architecture, Astronomy, Automation Engineering, Automotive Engineering, Biochemistry, Biological & Biosystem Engineering, Biology, Biomechanical & Biomedical Engineering, Botany, Ceramic Engineering, Chassis Engineering, Chemistry, Civil Engineering, Communication Engineering, Complexity in Applied Science and Engineering, Computational Science and Engineering, Computer Aided Engineering and Technology, Computer Applications in Technology, Computer Sciences, Continuing Engineering Education and Life-Long Learning, Control Theory, Data Mining and Bioinformatics, Design Engineering, Economics, Education, Electromechanical System Engineering, Electronic and Electrical Engineering, Energy, Engineering, Embedded Systems, Environmental Engineering, Food Engineering, Forensic Engineering, Forestry Engineering, Humanities, Industrial Engineering, Information Systems and Management, Instrumentation Engineering, Intelligent Engineering Informatics, Gas Engineering, Geography, Geology, Geometrics Engineering, Geotechnical Engineering, Linguistics, Management, Manufacturing Engineering, Marine Engineering, Materials Engineering, Mathematics, Measurement Science, Mechanical Engineering, Mechatronics, Medicine, Metallurgical Engineering, Microengineering, Military Sciences, Mineral & Metallurgical Engineering, Mining Engineering, Model Engineering, Nanoscience, Natural Sciences, Naval Architectural Engineering, Nuclear Engineering, Ocean Engineering, Oil Engineering, Petroleum Engineering, Philosophy, Physics, Political Science, Process Systems Engineering, Production Engineering, Psychology, Sensor Network, Sociology, Soft-Computing and Engineering Education, Software Engineering, Sound Engineering, Statistics, Strategic Engineering Asset Management, Structural Engineering, Telecommunications, Textile Engineering, Transportation, Water Resource Engineering, Zoology.